Dull metal surfaces can really let the look of your boat down and hinder efficiency. Boatsheen offers proven solutions for all brightwork inside and outside your boat. Strong, effective, diminishing grade abrasive metal polish for stainless steel, chrome, brass and copper. Removes scratches, surface rust, salt residues and dulling. Powerful – polishes even the most neglected surfaces to a bright gloss and leaves a clear protective coating behind. Very economical in use – the longer you rub, the finer the finish. Multiple acid blend which attacks the oxidisation coat on dulled metals such as alloy, brass and stainless steel, and dissolving marine accretions and bringing up a bright, as new, finish in minutes. 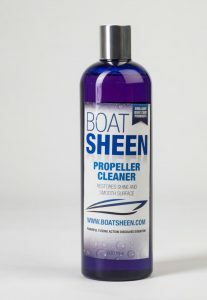 Boatsheen Propeller Cleaners’ powerful fizzing action dissolves oxidation, and also limescale all around your boat. Restores the original shine and smooth surface. Works in 1-2 minutes – simply spray on, leave, agitate and wash off when fizzing subsides. Repeat for thick accretions.